Blueprints for Successful Communities is a program of the Georgia Conservancy designed to facilitate community-based planning efforts across the state. Since the Blueprints program’s inception, we have worked in many different communities, including urban neighborhoods, transportation corridors, rural communities and environmentally sensitive coastal areas. In the summer of 2018, the community leaders of Atlanta’s Neighborhood Planning Unit-G (NPU-G) reached out to the Georgia Conservancy to assist in the updating of their 2010 Master Plan, which is a component of The City of Atlanta Comprehensive Development Plan. This plan update is tasked with addressing 8 years of community changes, but also with examining the area from a natural resource, green infrastructure and recreation perspective. During the fall semester of 2018, graduate students studying architecture and urban design at Georgia Tech specifically examined three Atlanta Housing sites within the neighborhood for their redevelopment potential, and how such redevelopment could have as minimal an impact on the watershed as possible. The students work, while conceptual in nature, has provided a lens and process through which to understand other parcels in NPU that will be incorporated into the full Master Plan Update. This project is generously supported by The Turner Foundation, The Wells Fargo Foundation and The Coca-Cola Foundation. Click here to view a presentation of the student work that was given to community members on February 22. The complete master plan update will be presented to the community later in Spring 2019. In 2017, Georgia Conservancy was approached by the City of Hogansville Downtown Development Authority (DDA) with the request to assist in a community revitalization vision as one part of a multi-phased effort to support neighborhood residents and stabilize the community. Georgia Conservancy reached out to partners at Canvas Planning and Village Green Consultants to assist in the urban design, planning, and market analysis work. The process, developed in concert with DDA leadership, included in-person stakeholder interviews, presence at the annual Hummingbird Festival, two public forums, and team meetings to identify a community-supported future vision for a revitalized downtown Hogansville. A truly collaborative effort, the Georgia Conservancy and a host of partners focused on both short-term and long-term strategies and solutions that will lend to the revitalization of Norwich Street in Brunswick, a vital, yet neglected, commercial corridor in the coastal Georgia city. The Project Team conducted three site visits, gathered and analyzed data, conducted stakeholder interviews in person and over the phone, conducted preliminary market analysis, and communicated with city leadership on the project. The Blueprints report provided the community with recommendations to improve public safety and street conditions, increase residential infill, develop better bicycle and pedestrian infrastructure, and pursue creative marketing and branding of the Norwich Street corridor. The recommendations of this community planning process aim to address neighborhood stabilization; strengthen community resources of identity, pride, and political prominence; and guide quality future redevelopment that keeps with the historic scale and character of this special place. The recommendations include both project ideas and policy needs and include small scale, low or no-cost actions that volunteer and neighborhood groups can undertake, as well as large-scale projects requiring significant investment from the City of LaGrange or private entities. It is this combination of efforts, through deliberate, thoughtful leadership of the neighborhood and City which will result in the revitalized Calumet envisioned by the Blueprints planning process participants. The Paulding County Land Use Plan revealed the value in continuing to direct future growth in areas already supplied with water and wastewater services, while encouraging future development to be impact-conscious in its footprint and connections. In prioritizing new development on vacant lots already served by water and sewer and prioritizing redevelopment in both established residential and commercial centers, both county government and future residents benefit from cost savings while natural resource impacts are minimized. This study also uncovered the challenges in development patterns that would worsen traffic and erode natural amenities highly valued among residents. As a result, the recommendations contained in this report reflect strategies which leverage existing infrastructure and established neighborhoods while accommodating growth in more natural or rural expanses through moderation and character-sensitive approaches. The intent of this semester-long workshop was to undertake case study research to identify national models that successfully integrate school access and active student mobility (non-vehicular) with transit investment and infrastructure coordination that are applicable to Atlanta. The workshop, in partnership with Professor Richard Dagenhart and graduate students from Georgia Tech's College of Architecture, was organized as a weekly one-hour workshop with a primary focus on the relationship among existing and future public transit, public right of way connections, and school facilities across the city. The Georgia Conservancy-sponsored Georgia Tech City and Regional Planning graduate level studio examined school siting issues and identified best practices of siting and coordination at the state and local level. Many factors drive school siting decisions, and those choices can have a ripple effect in the community. The team compiled an overview of current conditions, examples of alternatives and best practices based on a review of case studies, an assessment of the existing systems in Georgia in light of these best practices and recommendations based on the findings of the assessment. The studio examined the relationship between school location and development patterns and the transportation infrastructure necessary to serve the new schools; the secondary impacts of these investments and the designs of the school campuses on land use, development patterns, transportation options, environment, healthy living, and community development; and the determinants of school location, with particular attention to its policy and planning determinants and the ways the school boards address these determinants. The Chattahoochee River Park Blueprints studio, comprised of graduate-level students from the Georgia Tech College of Architecture, focused on a 53-mile stretch of river, from Peachtree Creek (southern border of the Chattahoochee River National Recreation Area) downstream to Chattahoochee Bend State Park in Coweta County. Chattahoochee NOW, a local non-profit focused on the sustainable revitalization of this corridor, in partnership with the Georgia Conservancy’s Blueprints for Successful Communities program, is leading efforts to catalyze the economic development and quality of life potential along the Chattahoochee River. Together, we envision the Chattahoochee River as a corridor of sustainability where recreation, preservation, community and development are interconnected. In this Blueprints studio we focus on the sea level rise impacts and adaptation opportunities for five communities along the Georgia coast: City of Savannah, Tybee Island, City of Darien, City of Brunswick, and City of St. Marys. Georgia’s coastal population, economic activity and culture will continue to be drawn to, and benefit from, a relationship with the water -- but what shape will the built environment of communities take in the future? Communities across the country are considering the implications of sea level rise and the options of defending the shoreline, retreating from the shoreline or adapting. We believe there is a way for Georgia’s communities, natural and man-made, to continue to thrive through adaptation. Through a research and design- based process the Blueprints team (composed of Blueprints staff, Professor Richard Dagenhart and the Georgia Tech graduate studio - composed of architecture, urban design and city and regionally planning students) made presentations, collected information and maps, conducted data collection within the community, and performed resident and business interviews to develop a set of draft recommendations for stakeholders’ consideration. These recommendations were supported by the community and form the basis of the final report. The final output of the process is a Blueprints report that includes responses and mitigation strategies for the future of Georgia’s coast. Implementation of plan recommendations will be the responsibility of governments and authorities which have jurisdiction in the identified locations. The Blueprints process seeks to involve existing government leadership so that the final plan can be communicated to a wide array of stakeholders. The report is the third report from the Georgia Conservancy looking into sea level rise impacts on Georgia’s coast. In fall 2014, graduate students with Georgia Tech’s School of Architecture set out to address one of the most pervasive and impactful pieces of infrastructure in our society, the interstate highway, and determine what potential exists to transform it into a travel corridor with environmental impacts that are far less degrading. The Georgia Conservancy-sponsored Blueprints for Successful Communities study focused on the Ray C. Anderson Memorial Highway, from exits 2 to 18 on Interstate 85 in west Georgia. This study provided the action plan and preliminary recommendations regarding the most suitable locations for future public and private development, as well as recommendations for managing existing infrastructure. Such recommendations will considered Ray C. Anderson’s vision for a zero impact company by 2020. To arrive to these recommendations for the Mission Zero Corridor, the students, under the instruction of Professor Richard Dagenhart and guidance of an urban design team from Perkins + Will, first had to understand what a sustainable highway corridor looked like, and in doing so, developed a framework that all future corridors could be modeled upon. This Blueprints studio describes and quantifies sea level rise’s impact on coastal Georgia’s economy and the potential repercussions. Sea level rise has the potential to affect communities equally but differently, so the Blueprints team focused on two very different sites to capture the diverse impacts - The Port of Savannah's Garden City Terminal and the City of Darien. The studio’s analysis is intended to inform elected officials, residents, industry, community planners, and others as they prepare for sea level rise on the Georgia coast. Moreover, the analysis reveals that sea level rise is not just a coastal issue, but rather is important at regional, state and even national levels because of the accompanying economic impacts. The Georgia Conservancy’s Blueprints for Successful Communities program, in partnership with graduate students from the College of Architecture at Georgia Institute of Technology, examined four different sites within metro Atlanta, adjacent to the Atlanta BeltLine (Ansley Mall- Peachtree Creek; Bobby Jones Golf Course/Colonial Homes - Peachtree and Clear Creeks; University Avenue- McDaniel Branch; and Boone Boulevard - Proctor Creek) and contrasted their development with existing drainage ordinances. These ordinances focus on controlling peak rates of runoff over more holistic, low impact development policies that could be adopted and implemented with great benefit to the community. Each project focus is site and watershed specific, though is meant to demonstrate the creative stormwater management alternatives present in situations that are duplicated across the state and nation. The proposals all begin with an understanding of the site’s position in its respective watershed, the hydrology, and its changing characteristics for the next generation, and the relationship of site conditions, stormwater management, and public spaces. In an effort to confront the challenge of planning for sea level rise (SLR), a graduate planning studio from Georgia Tech, in partnership with the Georgia Conservancy, has investigated potential impacts and adaptation opportunities for three counties along the Georgia coast: Chatham, Liberty and McIntosh. This research-based Blueprints for Successful Communities project hopes to provide guidance for local planners in the three-county study area, but also in the larger literature on the link between the impacts of sea level rise (SLR) with social vulnerability and cultural heritage preservation. This report seeks to place sea level rise, a global phenomenon, into context for the Georgia coast, creating a foundation of inquiry from which to launch this long-term planning process. Our hope is that residents, decision-makers and researchers will take advantage of the detailed warnings that we have compiled, enabling them to develop coastal communities that are better equipped for the coming changes. A once vibrant railroad town, Moreland is a 170-year old historic community located about 50 miles southwest of downtown Atlanta in Coweta County. Cotton and fruit also brought prosperity to the town, but the five rail lines were the driver behind the success of Moreland. The Great Depression began the decline of the town, and Moreland has faced consistent population loss for several years. Moreland has a population of about 400, an award-winning elementary school and strong historic ties to literary figures Erskine Caldwell and Lewis Grizzard. The Town of Moreland has struggled in marketing its strong history to attract more tourism and economic development to the town. A Special-Purpose Local-Option Sales Tax (SPLOST) has benefitted the Town of Moreland greatly, but the town is hesitant to spend funds without an appropriate action plan to help guide the town to achieve its goals. This drew the attention of the Georgia Conservancy’s Blueprints for Successful Communities program, seeking to assist Moreland with the creation of strategies and project recommendations that will revive the small Town. The Georgia Conservancy, in partnership with Georgia Institute of Technology’s College of Architecture and supported by Moreland leadership, led community stakeholders through an inclusive planning process to determine how to revitalize this historic area. This report is the result of these efforts. Focusing on issues of neighborhood connectivity and revitalization strategies, Town Square improvements, new zoning and subdivision districts, and a complete master plan, this report provides recommendations and strategies that build on existing assets and opportunities to revitalize the Town of Moreland. In the Lithonia Town Center Blueprints, the Blueprints team worked in partnership with the City of Lithonia and DeKalb County leadership to determine revitalization options for this historic town. Named for its unique granite geology, Lithonia, which means “city of stone”, is located in eastern DeKalb County within the Arabia Mountain National Heritage Area. Lithonia’s close proximity to the scenic and natural amenities of Panola Mountain State Park and the Davidson-Arabia Mountain Nature Preserve, its connection to these natural amenities through the PATH Foundation’s Arabia Mountain Trail, and its rich African-American history, along with issues of a declining downtown and lack of connectivity to local and regional assets, drew the attention of the Georgia Conservancy’s Blueprints for Successful Communities. This report provides recommendations and strategies that build on existing assets and opportunities with a focus on three major improvement areas: tactical urbanism (immediate actions), plaza revitalization, and long-term redevelopment. In this Blueprints, the Georgia Conservancy worked with Augusta leadership and community stakeholders in an inclusive planning process to develop prioritized revitalization steps for the historic Harrisburg neighborhood. Located just northwest of downtown Augusta, this 200-year old historic neighborhood has experienced an increase in renter-occupancy rates, disrepair of housing stock and public safety concerns. The neighborhood, however, is home to some regionally and nationally significant assets such as a walkable block structure, historic mill housing and mills, the Augusta Canal National Heritage Area, and the Salvation Army Kroc Center. Building on these assets and addressing community challenges, this report focuses on issues of neighborhood identity, neighborhood revitalization strategies, Broad Street improvements, Augusta Canal connectivity, and Calhoun Expressway alternatives. This Blueprints studio worked with residents of northwest Atlanta’s Neighborhood Planning Unit-G (NPU-G) to develop solutions that take advantage of the NPU’s assets – an industrial park, the Chattahoochee River, proximity to downtown Atlanta, new development opportunities, and other environmental and cultural resources – to address the challenges facing NPU-G – low employment, lack of retail and services, decaying housing stock, and poor public transportation options. The Georgia Conservancy's Blueprints for Successful Communities assisted the coastal community of Pin Point is establishing a vision for the future that embraced preservation of the community's heritage as part of the Congressionally-designated Gullah-Geechee National Heritage Corridor while addressing the immediate needs of property development and infrastructure improvement. The Georgia Conservancy produced a land conservation plan for the county that looks to the year 2050, envisioning a build-out scenario where the county could preserve its rural character while accommodating additional population growth. This was achieved by designating up to 50 percent of the county’s land for compact communities and 50 percent for "green" land uses including conservation and recreation land, agricultural land, and very low density, low impact development. This Blueprints studio worked with the Lindbergh-LaVista community to create a strategy that focused on development nodes, multi-modal transportation corridors and green infrastructure to improve the community, preserving existing single-family neighborhoods, improving pedestrian and vehicular circulation, and enhancing neighborhood identity. Transportation planning along LaVista Road, a major corridor in DeKalb County, led to the adoption of the transportation recommendations from this Blueprints report into DeKalb County’s Comprehensive Development Plan. One of the smallest study areas to date, this Blueprints studio focused on a four-block area at the intersection of two congested roadways. "Collier Village" is an aspirational name for an underutilized commercial area on the brink of major redevelopment. The Blueprints studio addressed pedestrian safety, connectivity, environmental concerns, zoning, land use and urban design. In a classic Community Benefit Agreement, Collier Village took one of the recommendations from this Blueprints report – fix signal timing and add a traffic light – and negotiated with a developer who was building a large-scale development nearby to pay for both the signal timing and the traffic light improvements. Building from BeltLine planning, this Blueprints studio reframed the transportation and transit discussion, developed templates for corridor redevelopment, addressed green space connectivity, and looked at infill redevelopment opportunities around transit and brownfields in an area spanning 37 neighborhoods. With a focus on maintaining workforce housing and increasing connectivity, this Blueprints studio identified methods for protecting the single-family neighborhood core of Piedmont Heights while planning for compact, pedestrian-friendly development on its fringes. In this Blueprints, we worked with stakeholders to look at alternative zoning approaches to housing, economic development, transportation, and protection of cultural and natural resources. A land use plan was developed for Toccoa to guide future growth, outlining zoning strategies for a number of character areas including greenway corridors, agricultural areas, rural residential areas, urban service delivery areas, and historic/cultural areas. This Blueprints organized and educated a stakeholder committee to identify assets and challenges within their watershed. After defining conservation and economic development priorities in three sub-watersheds, a watershed stewardship program was established to implement the recommendations through promoting public awareness and action. In this Blueprints, a partnership with the Atlanta Neighborhood Development Partnership was formed to identify ways to stabilize and improve one of Atlanta's oldest in-town neighborhoods. Strategies included redeveloping vacant property, creating neighborhood retail nodes, and leveraging funding opportunities. This Blueprints recommended methods by which neighborhoods along the north DeKalb section of LaVista Road could establish pedestrian connections within the planning area, address incompatible infill development, strengthen the commercial core, and preserve parks and greenspaces. This Blueprints proposed the Ocmulgee National Heritage Corridor as a way to promote education, understanding, and appreciation of the Ocmulgee River’s natural and cultural heritage and as a strategy for protecting these resources and promoting economic development. Working with the City of Moultrie and Colquitt County, this Blueprints identified tools to protect a strong rural agricultural community in a way that is economically viable, exercises stewardship of natural resources, and promotes the progress of new and existing businesses. This Blueprints provided recommendations to Assist the neighborhood of Berkeley Park in developing a vision for the neighborhood and identifying potential strategies to mitigate the impacts of growth in the area while maximizing the benefits of private and public investment. This Blueprints worked with the small coastal community of Sandfly, one of the oldest African-American settlements in Georgia, in an effort to maintain the community's unique character in the face of commercial development. Sandfly was rapidly losing its heritage and identity as it became increasingly squeezed by commercial development and a new interstate interchange. Blueprints helped organize the community, gave them a voice, and the tools with which to talk with developers. Over the years, Sandfly has managed to stay involved in conversations with developers and with the County and is now planning for a new bike and pedestrian trail to link to their community with schools, parks, and neighboring communities. Addressing greenfield and greyfield site options, this Blueprints identified a framework for redevelopment in the larger surrounding commercial area of the Highway 20/138 corridor. This Blueprints examined the sections of the proposed Atlanta/Athens rail corridor within Barrow and Oconee Counties, studying how these largely rural areas could incorporate rail stations within them and prepare for projected growth while preserving their character. This Blueprints examined the Gwinnett County piece of the proposed Atlanta/Athens rail corridor, studying how the urban and suburban communities of Dacula, Lawrenceville, and Lilburn could incorporate rail stations within them and capitalize on the economic development potential. This Blueprints tested components of the Athens-Clarke County proposed Concept Plan and Future Land Use Plan on three areas of the city, presenting options for urban design and future development configurations. This Blueprints worked with Home Park, a neighborhood in Midtown Atlanta, to create a plan that would protect the community’s assets and solidify a neighborhood organizational structure. In 1999, Home Park was being squeezed on one side by an expanding Georgia Tech campus and on the other by a brownfield redevelop, known today as Atlanta Station. Blueprints recommendations included actions to protect the historic single-family core of the neighborhood, define the neighborhood edges, ensure the continued diversity of housing and income groups, and establish what has been an ongoing dialogue with both of its neighborhood communities. In addition Home Park leveraged work done in the Blueprints process to fund a neighborhood master plan. With a focus on economic development, this Blueprints proposes a plan for revitalizing the inner-city neighborhood of Lakewood Heights, improving its appearance and fostering neighborhood pride. This Blueprints evaluated the impact of rapid population growth and a proposed commuter rail station in the historic railroad town of Senoia. Recommendations were made to allow Senoia to manage growth while preserving the town character and enhancing quality of life. 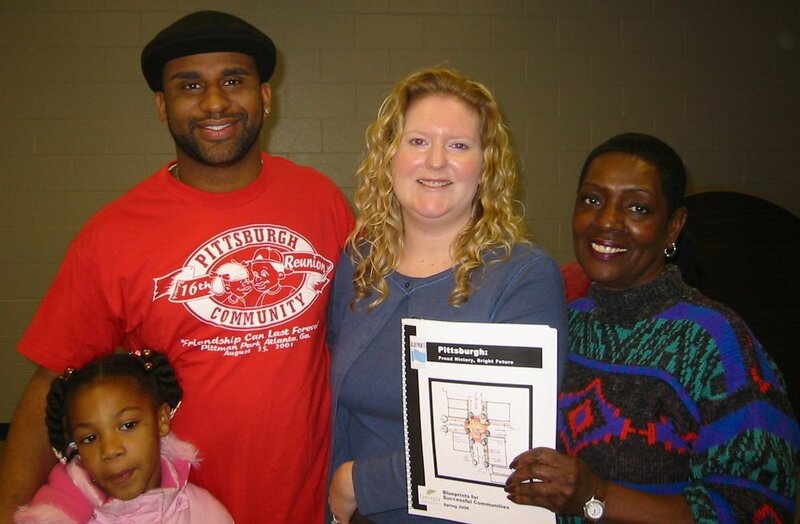 Our first Blueprints community planning workshop was held in 1997 in the City of Covington in Newton County. The City and County were trying to accommodate growth while maintaining their small-town, rural quality of life. One of the recommendations coming out of the Blueprints report was to establish a non-profit community organization to oversee future development in Covington. The outgrowth of this recommendation is the Center for Community Preservation and Planning, which has risen to be one of the leading champions of quality growth in Georgia. The most successful aspect of The Center is that it makes planning visible and understandable to the citizens of Covington and Newton County. Some of the projects that can be directly attributed to The Center’s efforts are: The Covington & Newton County Trails Master Plan, The Clarke’s Grove EarthCraft Community Pilot Project, and The Square Market, Covington’s public market.